Our Bing tribute has delighted audiences for over 30 years with his good, clean humor and his remarkable likeness in sound, appearance and mannerisms of Bing Crosby. His tribute shows are endorsed by Kathryn Crosby, Bing’s widow, and he and Kathryn have performed throughout the United States on several occasions in special tribute shows to her late husband. 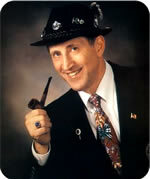 He is also endorsed by all the major Bing Crosby Fan Clubs. You are invited to take a nostalgic journey with our Bing Crosby tribute show...you will never forget. All shows include a variety of musical selections and good, clean humor with a variety of formats ranging from live musical accompaniment to professionally pre-recorded arrangements and can be customized to fit your needs. Looking forward to bringing you back down Bing lane!